So this rendering nugget was mostly covered up with the title on the article. First thing is the sidewalk isn't wide enough for patios on Akard. That section is already one lane wide in each direction. Also since when is anyone making these kinds of changes to Pegasus Plaza? Those LED bars on every other floor will be interesting, I guess. Sorta like KPMG building but horizontal. They need to reclad it with its original curtain wall. Last edited by joshua.dodd on 26 Mar 2017 09:15, edited 2 times in total. what tower is that in this photo behind magnolia? i know thats the current placement of pegasus plaza. Never knew there was a tower that big before it. Saint Louis architect Preston Bradshaw's Baker Hotel is the hipped-roof brown one peeking out. That's where Whitacre Tower is now. To the foreground is George Dahl's Southwestern Life Building, southeast corner of Akard and Main, where Pegasus Plaza lies now. dpl-1202 wrote: what tower is that in this photo behind magnolia? i know thats the current placement of pegasus plaza. Never knew there was a tower that big before it. Southwestern Life Insurance Building, built in 1912 and designed by Lang & Witchell. At 16-stories and designed in the Sullivanesque style, in 1971 it was demolished by new owners who said "Right now our goal is simple to raze the building. From there on we have no specific plans." Also visible is the 1925 red brick Southland Life Building, which was part of the 2 blocks demolished for Southwestern Bell. The 11-story building was also designed by Lang & Witchell. joshua.dodd wrote: They need to reclad it with its original curtain wall. How bizarre that they changed it. It really did look much better before the alteration. 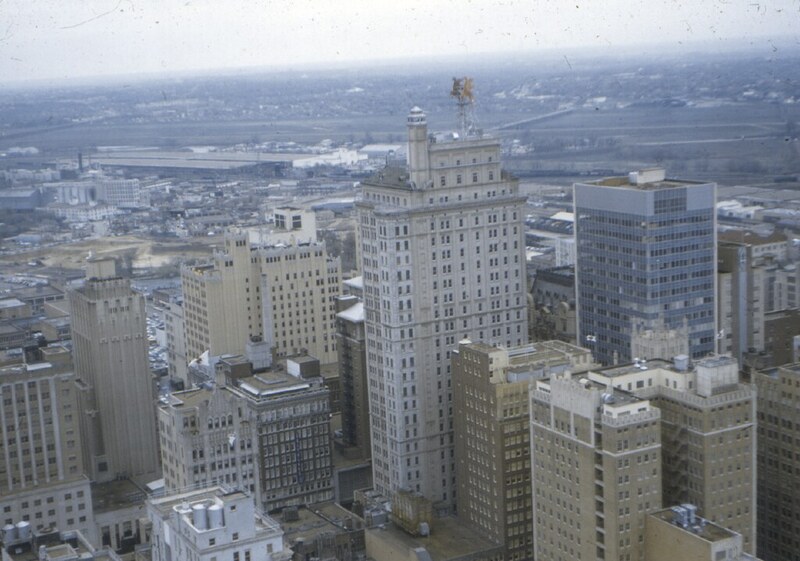 I45Tex wrote: Saint Louis architect Preston Bradshaw's Baker Hotel is the hipped-roof brown one peeking out. That's where Whitacre Tower is now. To the foreground is George Dahl's Southwestern Life Building, southeast corner of Akard and Main, where Pegasus Plaza lies now. not to be a hater- but i really wish Whitacre Tower didn't exist - for my own selfish reasons. I step out on my terrace downtown and i look right into the 13th floor of that building. I would have quite a view if it was shorter or simply not there at all. Found this rendering doing some googling. I still don't see where this sidewalk space is coming from when the street pictured in a similar rendering above still has both lanes still in tact. I think those are the existing sidewalk widths... but they just put up itty-bitty umbrella tables and chairs. In reality, you could probably get away with about four small tables with chairs and no parameter fence. Curious about how much of this they get away with. Certainly it can't be done as drawn. You could barely fit a wheel chair through the remaining sidewalk. You could fit two seats with cafe tables there but no umbrellas and definitely not four seats and a big round table with the decorative fencing. We will see what the actual final product is because its already in motion. I agree with the two seats statement. Google earth measurements put the Akard sidewalk at 10-12 ft wide, so that would be a more reasonable concept. Freshii had outdoor seating at one point. Here is another great photo of the Southwestern Life Insurance Building, with Adolphus Tower next door in its original curtain wall cladding. You can zoom in and see the base of this building and the good amount of retail it had. It was basically a shopping center. What they really need to do is restore the original architectural facade this once boasted. So nice to see downtown opening up onto the streets again. Soon, hopefully, we'll be taking about street renovations that consolidate peak commuting traffic to a handful of strategic thoroughfares rather than street renovations that expand and reclaim pockets of pedestrian environment into the existing street grids casting net of commuter access.